The Puppies have all been placed into their new homes. SOLD OUT. GSPs are the perfect companion dog for the active family. 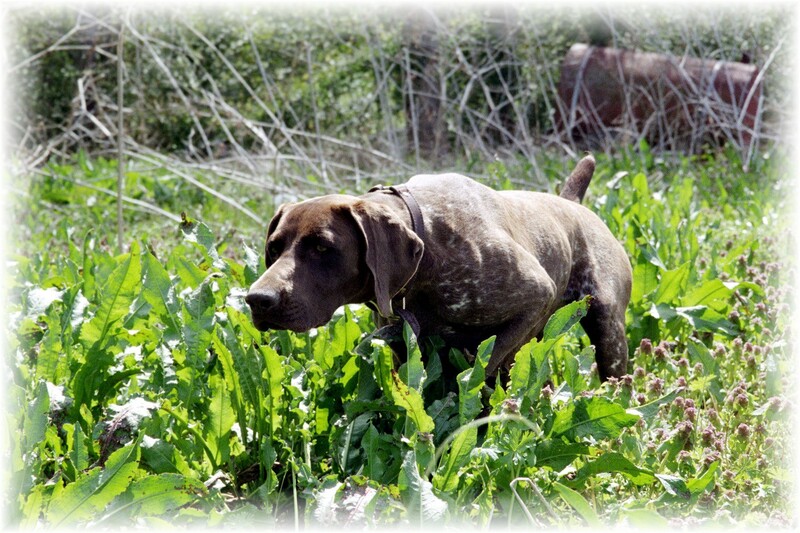 A hunting dog should not only be bred for the field and kennel but for the other 8 months of the year as well. 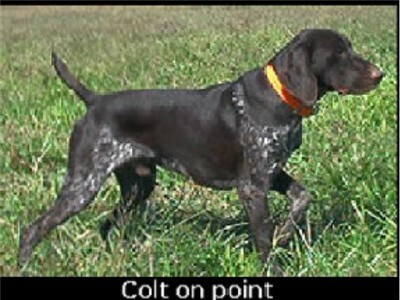 At 8 months and 8 days old, Colt was the youngest pointing breed dog in 2002 to have earned his Mater Hunter's title. Colt is testing for his NAVHDA Utility Dog title soon. And this winter he will enter the show ring for the first time to take his place among other top-rated GSPs to earn his confirmation championship. Calm temperament and ease of training are some of his greatest attributes. He has excellent conformation to the breed standard and is certain to earn his Versatile Championship and AKC Dual Championship. Aurija earned her Junior Hunter in 4 straight tests under extreme weather conditions; the first two tests were in freezing rain and sleet and the last two were in dry 80+ F temperatures. Aurija exhibits exceptional conformation, drive, stamina, natural retrieve, and style. Aurija is training for her Master Hunter title and is expected to earn it this fall. This breeding has been planned for months to pull together the tremendously positive traits in both of these fine dogs in a litter we expect to earn a breeder's award. Aurija's PennHip Evaluation is 0.29 (Left) / 0.29 (Right) which places her in the 80th percentile for GSPs where the median hip laxity is 0.36 meaning that she has hips that are tighter than 80% of all tested GSPs and shows no radiographic indication of degenerative joint disease (DJD), cavitation, or other defect. See the link to the right for more information on the PennHip evaluation criteria and the Orthopeadic Foundation for Animals (OFA). Accept cash, cashier's checks, money order, wire transfer, or direct deposit. I have provided a copy of the puppy purchase agreement to this site (a link is located on the left-side navigation bar), in addition I am offering a three-year health warranty on all pups. 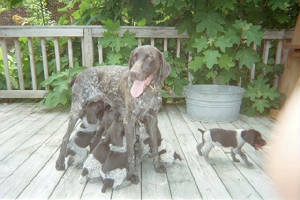 I am registering the litter with the AKC and North American Versatile Hunting Dog Association (NAVHDA). I would like to encourage the new owner to register, train and enter your pup in a NAVHDA Natural Ability Hunt Test. Both myself and the Sire's owner will offer you our services to assist you in accomplishing that goal if required. There are many reasons for this but the most important reasons is to evaluate the breeding program and ensure that only the best dogs of the breed are used to improve the breed as a whole. This is a tradition steeped in the German system of registry and breeding that has molded the German Shorthair Pointer to be the truly wonderful versatile hunting partners and family companions that they have become. If you have any questions on how to accomplish this please contact me, it's not as formidable a task as you might think and the time spent with your pup and other dedicated owners of Versatile Hunting Dogs will enrich your experience with the pups beyond compensation. These, like all sporting dogs, are a dog bred to work and are happiest when doing what they were originally bred to do, I highly encourage all new owners to particiate in NAVHDA and AKC sanctioned events with their dogs.